The Chemtrails Challenge: It's your conspiracy theory, now you need to prove it! | Time to do some work. Chemtrails after San Francisco plane crash? Recently there was a plane crash in San Francisco. Surely, detectable levels of the evil chemicals they are spraying were released? Was anyone there to measure? Let me know, because I’m curious. It just seems, once again, that chemtrails conspiracy theorists are just lazy. I truly don’t think anyone has even tried to measure, even though it would have been very strong evidence to support the chemtrails case. Perhaps one of the pictures of the broken plane reveals a hidden infrastructure? Didn’t think so. If you’re one of the chemtrails believers, this is for you: you’re full of assumptions, and seem less than eager to bother trying to actually confirm or refute anything. That’s a poor combination. The only “evidence” is the blindingly obvious: air planes spew exhaust fumes, including water vapour. You can continue filming that and sticking it on YouTube, but you’re really not convincing anyone. If you’re going to do anything, do it properly! Take the challenge! I dare you. Get organized. Or is that too difficult? Please take this quick anonymous poll so we can find out what people think chemtrails are for. As mentioned on twitter recently, there were over 14000 spam comments on this small website. This was cleaned up using a few thousand mindless brainwashed sheeple working under threat, I am the Illuminati after all. Oops, did I actually write that? I mean, er, it was cleaned up using an anti-spam plugin, and deleted. Everything went, so if there were any real comments there I’m afraid they were lost. Please try again, new anti-spam countermeasures have been added to avoid accumulating lots of spam again, so that the comments section can live. Of course, we must never admit that this was done because someone had posted a perfect argument proving chemtrails, and since those comments couldn’t be allowed we had to delete everything. Oh no, I’ve done it again!! After I posted on chemtrails believers moral obligation, a thread started at a forum that appears to harbour a lot of conspiracy theorists. It makes for entertaining and enlightening reading. Amazingly, this conspiracy theorist feels he is being blocked by debunkers!? Unlike the rest of the free world, Goldcurrent appears to hold debate as destructive rather than constructive. First of all, if something is debunked, it is shown to be wrong, so he clearly wrote this wrong, otherwise he says he’d believe it even after it’s debunked. That would be a classic classic conspiracy theorist approach, but not one that I’d think is consciously chosen. And contrary to what he says, I’d say I’m helping him think straight, not blocking anything at all. I would hope any chemtrails believers would be nudged in the direction of actually proving any claims they have by posts such as these, rather than tirelessly digging themselves deeper into a conspiracy hole together with other believers. Conspiracy theorists, why won’t you take the challenge? For the record, I don’t consider myself a debunker. I challenge claims, I haven’t debunked anything. But time will help me, if nobody ever meets the challenge, there’s nothing to believe any more. I’m curious. Were any of the expected chemtrails chemicals or biological agents detected in Lower Manhattan after 9/11? Oh, right, that was a conspiracy too, wasn’t it? Aren’t you beginning to feel a bit like Jim Carrey in The Truman Show? If you sincerely believe there is a chemtrails conspiracy going on, you have a moral obligation. If you think there’s an unhealthy operation led by government agencies that is making us sick or controlling our minds (or both), you really have to do something about it. Your moral obligation is to document what is happening, in a way that is convincing. Reproducible findings documenting release of non-exhaust chemicals might be one way to do that. Sharing links to 100 page long government working group documents about geoengineering or weather modification is not enough. Pictures and videos of contrails in the sky are not convincing, the contrails are there because the air is a busy place. Insinuations are not enough! How can you sit back and watch while this is taking place? How can you NOT do the real work you know is necessary, when people are getting ill, perhaps even you and your family? How can you not organize and do the real, open, well planned and reproducible research necessary? What are you doing that is more important? This moral obligation does not apply to me, because I sincerely do not believe this is taking place. It’s up to you and your peers to design a methodology to document that this is happening, so that chemtrails doubters can be convinced. This is the challenge. I honestly don’t think you’ll manage. Surprise me! There are several explanations offered to lend credence to the chemtrails conspiracy theory. I’ll list a few of them here, and I’ll leave it to the readers’ own common sense to judge whether these are even possible or not. If I’m able to withhold my opinions, that is, which I’m afraid that I can’t promise I’ll manage. Depopulation. Apparently, some people think that there’s a massive effort underway to depopulate the world, and it’s called the New World Order depopulation agenda. I refuse to give authors of this stuff credit with a link. If you want to unconfirm this, read about life expectancy developments, visit an old people’s home, visit a mortuary, or come up with some better ideas yourself. You’ll probably discover that people are getting older and older. However, they are also having fewer children. In fact, global population is expected to plateau around 2050 in any case, which is going to bring a host of new problems these guys don’t understand. Prevent global warming. According to some, chemtrails must be a massive geoengineering effort to prevent the world from overheating. But the chemicals used are really bad for us. One wonders how life expectancy increases while this is going on, or how athletes keep setting new world records for short and long distance sports when this is so poisonous. It’s such a successful cover up that nobody noticed, like, really nobody on this planet. Pollution. Some people are just so pissed off at pollution that they will consider it chemtrails, a cover up and government plot. I wish they’d work against pollution in a more productive way. I’m sure there’s more. Leave info in the comments, and I will extend the article. Here’s a typical chemtrail misunderstanding. According to the poster, this video is proof that chemtrails are not contrails, because it shows “chemtrail sprayers filmed from inside several different jets spraying chemicals.” However, this video shows planes dumping fuel, which happens on some occasions, for understandable reasons. This is not documentation of some organized secret scheme. This is a misguided effort by a confused individual. So now chemtrails and pollution are the same? Don’t get me wrong, I welcome efforts to reduce pollution, but mixing up conspiracy theories is not helping the posters argument. In fact, quite the contrary! I find conspiracy theories like chemtrails amusing, although it’s sad that misguided individuals waste time and energy on this. 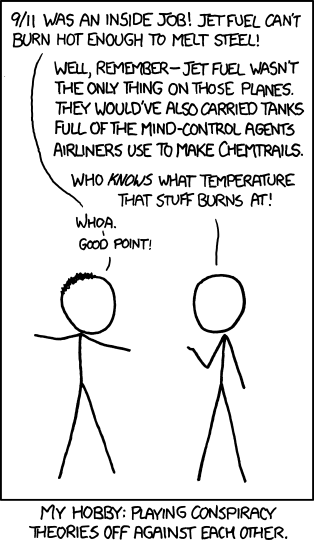 Here’s a comic (by xkcd) on chemtrails and conspiracy theories. Hilarious.